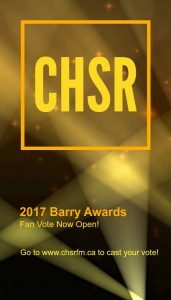 Home » Specialty » Announcements » CHSR 97.9FM’s 2017 Barry Awards Fan Vote! Thanks for voting! Polls are now closed. Winners announced January 22nd! It’s that time of year again, for YOU to show YOUR support for your favourite CHSR show and host! Legend tells it, in 1960 a young Barry Yoell attended a conference in Toronto about radio. Enthused by that conference, and after a lot of generous donations and hard work, the campus/community radio station that now bears the name CHSR was born in early 1961. To honour that hard work and the legacy of great radio that Mr. Yoell started, the Barry Awards were created on January 22, 1971 (The 10th Anniversary). Each year, we award the best shows and hosts and show our appreciation for the work that they do — and we want the audience to have a say!